This girl is Sally from Cardiff. I totally adore her playful style. She is not afraid to mix and match and her love of colour is obvious. I like how she managed to flawlessly combine the floral jacket with the purple tights. She has a relaxed, flirty look that is also soft and feminine. Real pretty! And my favorite look!! 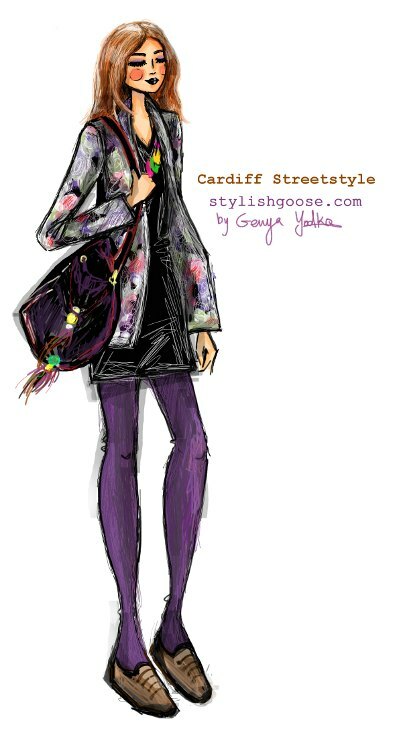 Go here to see all the Cardiff ladies participating in the Grazia Street Hunter Awards. Till tomorrow, when Stylish Goose illustrates one of the Bristol girls. Look at this sophisticated girl! A really neat look from Lauren of Birmingham. This look, by the way, is my sister Anna's favourite look from Grazia Street Hunter Awards. It is so put-together and elegant, with some really amazing use of colour! I love that she pairs a printed t-shirt with an office pencil skirt, making this look traditional-with-a-twist. Check out all the Birmingham ladies here. Which one is your favourite? Cardiff is next! It will be posted later then I planned, but I have a good reason :). I am having a special birthday dinner with my bf's mom for her b-day (Happy Belated Birthday Andree!!)... However, the wait will be worth it as it happens to be my personal favourite look in the Street Hunter Awards. Less then a week until the polls close for Grazia Street Hunter Awards, and I am looking at the stylish ladies of Nottingham, as I illustrate my favourite looks from each city. Today, my vote goes to Kelly for her creative approach to dressing. She is dressed in soft grays, whites and a hint of purple, looking lovely and feminine. I love her beautiful floor sweeping skirt and her ruffled jacket. Her printed tank gives this look an artsy and bohemian touch. She accessorized her look with some bright tangerine earnings, which accentuate her face. What do you think about Kelly's look? 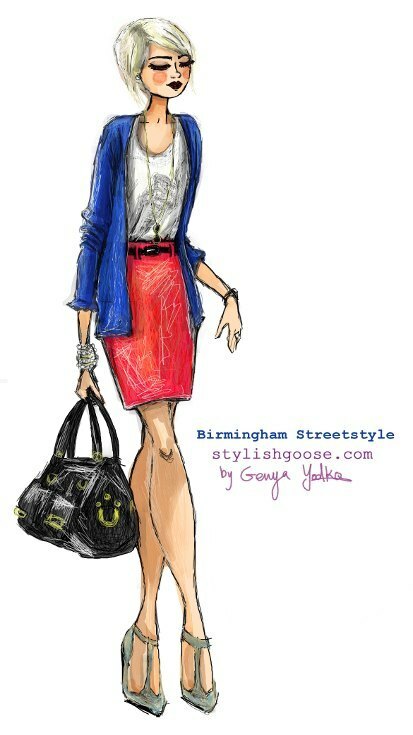 Get ready for Birmingham tomorrow for another Stylish Goose illustration! PS. I learned today that a talented photographer Phill Taylor took most of the Street Hunter Awards photographs, with exception of Manchester photos, which were taken by Wayne Tippetts. Check out their London street-style blogs for hours of enjoyable browsing! This morning I had a nice surprise when I opened my email. 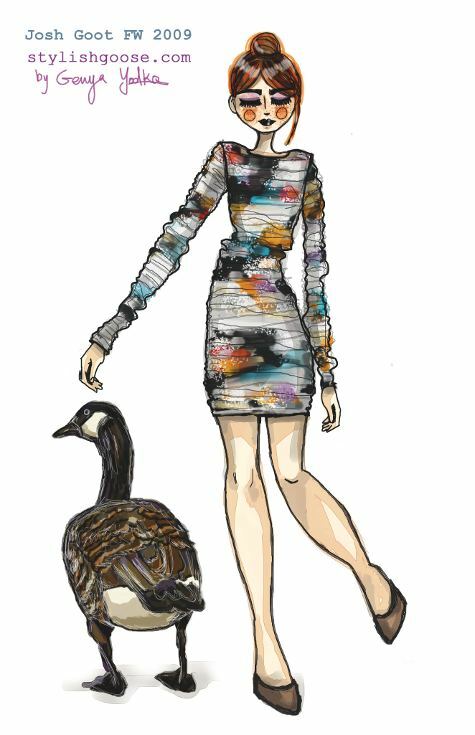 A message was waiting for me from Hannah at Grazia Style Hunter, who wanted to do an online story about Stylish Goose's illustrations of the Style Hunter Awards! And ta-da! Here it is! I wanted to say Thank You to Grazia for this exposure. It is an honour. Also, Thank You to the growing base of Stylish Goose readers. It is a new blog, but I am so pleased to see the encouraging comments from you. Your support is greatly valued! Moving on to Manchester where UK's Grazia magazine photographed several stylish girls in for the Style Hunter Awards. You can see their pictures here. 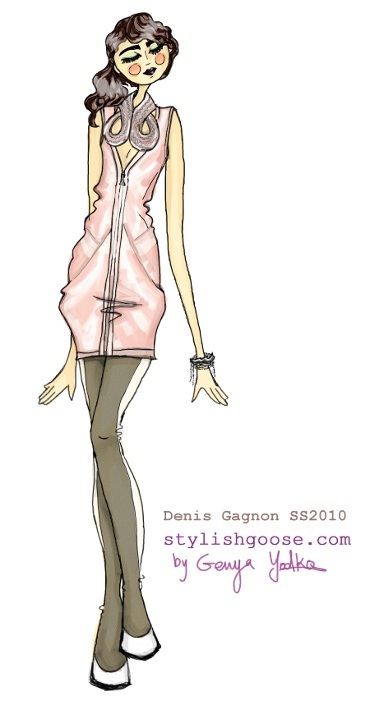 I illustrated the confident Danusha, whose style is a complete standout. She is wearing a neon blue dress and really wonderful geometric tights. The silhouette is very simple and relaxed, and the bright colours add total excitement to Danusha's look. Danusha got my vote for her confidence, uniqueness and individuality. And I really love her short bob! Come back for more tomorrow - I'll be illustrating my choice for Nottingham! This classic girl is Sarah. She was photographed on the streets of Leeds, UK by the Grazia Style Hunter Awards team. Here are the other pretty Leeds girls that are taking part in the awards. I decided to vote for Sarah because she is dressed for success! She looks like such a go-getter and has a neat, put-together style. This PhD student is dressed really smart in a striped short nautical dress and a fitted blazer with rolled sleeves. I love her polished patent shoes and the naval badge on her dress adds some playfulness to this straight look. What do you think about this preppy look? I am excited for Manchester tomorrow. Come back and see what Stylish Goose votes on! Follow-up Note: After posting this illustration, I was contacted by the lovely Sarah herself! She also has a very fashionable blog called mocha-soy-whippy, which I began checking out regularly. It is always exciting when the girls I illustrate comment to introduce themselves to me. Makes me really happy to I hear from the real person who inspired the picture. So if you recognize yourself on Stylish Goose, please, drop me a line! 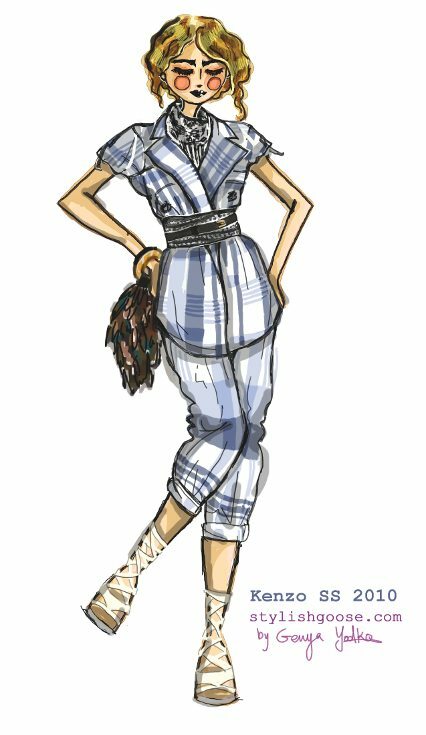 Following the illustration of my Edinburgh choice for the Grazia Style Hunter Awards, here is the illustration for my favorite look from the Glasgow batch. You can see all the contenders here. I drew the pretty Nicola in her flirty pink skirt. I like the contrast between the overly girly, short skirt and the loose boyfriend denim shirt. The slouchy look is stylish, but still casual and effortless. Look at her bright bracelets - they add an additional pop of colour to tie in with the skirt. Would you agree with my choice? All of the Glasgow girls are looking good, so it was a hard one. Moving on to Leeds tomorrow! 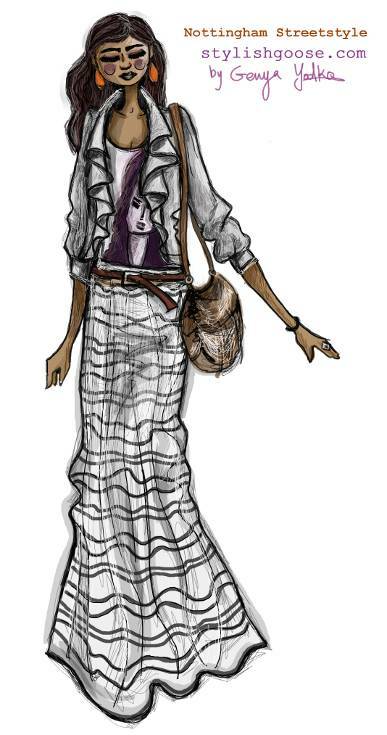 As I mentioned in my previous post, I am illustrating my choice for the Grazia Style Hunter Awards, one city at a time! Starting with Edinburgh, see all the lovely ladies here. This illustration is of Genia. She is just glowing! Genia got my vote because I adore her relaxed, put-a-smile-on-your-face, vintage style. The detailed multi-coloured print on her dress is fantastic and she truly looks stylish and comfortable. The dusty-blue bag and the delicate flats are really great understated accessories that refine her look. And a bonus point goes for our shared name ;). What about you? Who would you choose as Edinburgh's most stylish woman? Come back tomorrow and see what Stylish Goose chooses for Glasgow! I have something fun planned for the next 11 days! 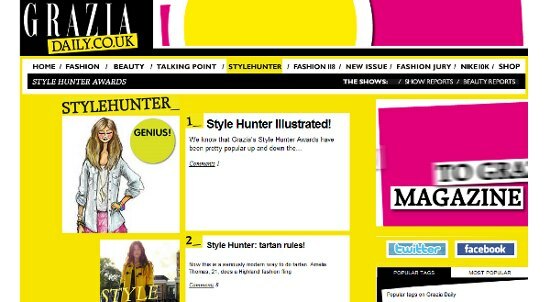 Have you heard about the Grazia Style Hunter Awards? A team of street-style photographers traveled to 11 UK and Irish cities in 11 weeks with the goal of finding "the nation's most stylish women" - one from each city. The votes on the best look can be made by readers until November 3, which coincidently is 11 days from tomorrow! As the daily countdown progresses, I will be illustrating and posting Stylish Goose's favorite-look-of-the-day from each city. Come back daily and see what Stylish Goose votes on!! P.S. London photographer Wayne Tippetts shot the advertorials for the awards. As with my previous Street Style illustration (Vintage Style captured by Wayne Tippetts), Wayne's blog Streetstyle Aesthetic inspired me yet again. Thanks Wayne! - Resort is not over-exposed and over-advertised, making clothes long-lasting and less trendy (this is a good thing!!). - Resort designs feature good balance of innovation and practicality, resulting in versatile and unique pieces that can be worn all year round. - Resort price points are more wallet friendly. This is always a bonus. 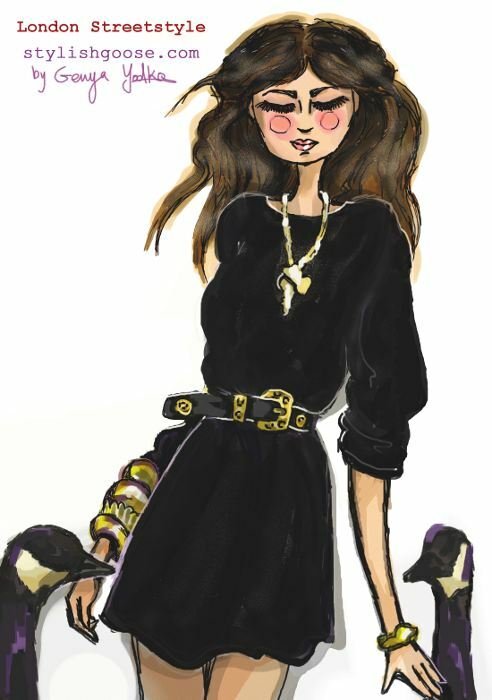 I have illustrated one of Phillip Lim's beautiful Resort 2010 looks. See it here. I love the combination of a plain gray fisherman-type sweater and a delicate sun-bleached floral skirt. It makes for one effortless but stylish look, that is as relaxed as Resort can be. I love the chunky brown pirate belt that holds the pleated skirt together. This is a nice, easy look to put together by yourself. I was reading my favorite fashion blogs, looking for some inspiration for the next illustration. Then I saw this picture of an Australian Harper's Bazaar fashion editor, taken by Vanessa Jackman. She was wearing a really lovely Josh Goot dress, that made me want to re-visit his fall collection and take a second look. I did not find this exact dress in the runway shots, most likely because the retail version can turn out slightly different then the samples. So I chose to illustrate another dress. See it here. Isn't this a gorgeous dress? It has some nice gathering details all over that make it look like it is made of many ribbons. Josh Goot is an up and coming Australian designer, who shows his collections at the London Fashion week. This look is from his Fall 2009 collection. The collection was inspired by rock formations and is minimalistic, chiseled and marble coloured. My favorites are the last looks in the collection - they have a really nice pattern and I like the soft shades of colour. Amongst the Paris shows, Kenzo collection is the one I started to look forward to every season. What I love about Kenzo is the depth and meaning put into the clothes, as well as the amazing textiles used to construct them. The Kenzo looks have this rich textural and layered feel to them with a variety of fabrics, knit, vintage-y prints and detailed embellishments seamlessly incorporated together. I enjoy the thematic and culture-oriented aspect - their collections take me to another place and a different time. The creative director behind the new Kenzo is an Italian designer Antonio Marras. He is definitely a self described romantic and brings "a touch of poetic idealism" to his work (this is his own quote from WWD in the January 22, 2009 issue). His collections are always well-researched and have a strong cultural context, in a very feminine and pretty way. I think the SS 2010 is great! I illustrated one of the looks that caught my eye. It is an interesting twist on a woman's pantsuit, with pants being rolled up and jacket nipped at the waist with a wide fabric belt. A really cool and relaxed look. See the original creation here. By the way, did you notice the unique feather bracelet clutch that I illustrated? It is a nice little discovery I made recently by couture accessories designer Raven Kauffman. If you look at her collection of dramatic bags and delicate clutches, you'll soon realize that she loves birds just as much as Stylish Goose does. 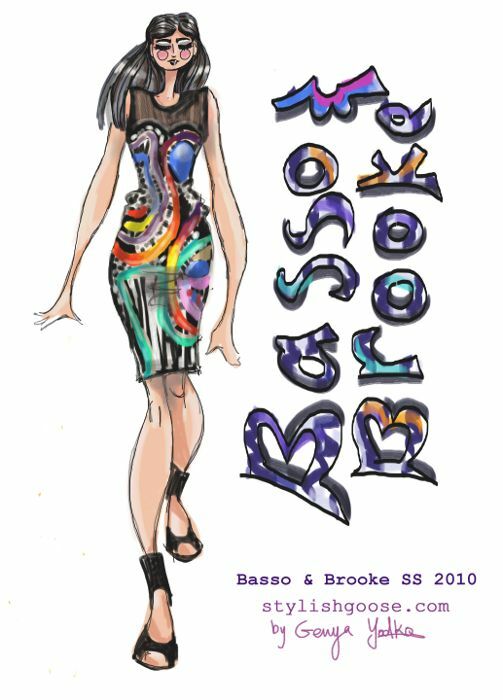 Everyone should know about Basso & Brooke - a young London based brand known for their wild love of colour and bold experimental prints. The first thing you will find out if you google them is that they are big on digital prints. Just look at their collections on style.com and you’ll see why they have this reputation. I’ve illustrated one of my favorite dresses from their recent SS 2010 runway show. I really like the cool and unpretentious style, paired with the wild original print. It is vivid, artsy, futuristic, and very very pretty. See a photo here. And on a related topic, I began to notice that more and more digital prints are popping up on the runway those days. It seems that digital prints are becoming common in the fashion world, as several established designers have incorporated digitally printed looks into their luxury collections. For SS 2010, those brands include: Alexander McQueen, Helmut Lang, Matthew Williamson, and of course Basso & Brooke. Also, several newer brands that include Peter Pilotto, Michael Angel, Krystof Strozyna and Mary Katrantzou are gaining reputation for their signature digital prints. So I wanted to know more about what digital prints are all about and why they are so popular with the designers. I found out that digital printing for textiles is a fairly new process and its technology is still being improved and enhanced. Definitely lots of potential and innovation going on here... The biggest advantages of digital printing are that it is very fast, cost-effective, low on waste (i.e. the hot words: “environmentally friendly”!!) and most importantly has limitless artistic potential. Wow, I am sold already! The traditional method for fabric printing is using rotary machines. This requires metal rollers to be engraved with the design, and if multiple colours are needed then several customized rollers for each colour are used. Those rollers are then mechanically pressed onto the fabric to create print. In comparison, digital prints have unlimited colour possibilities that give the designer total freedom and creative control. There is a lot of flexibility during production and the designer can even change the design during a print run. Time savings are huge because digital printing can be complete in hours and not weeks as with the traditional method, for a similar amount of fabric. And we all know that speed is very important in the fast paced fashion industry! Expect to see more interesting digital prints on the runway in the seasons to come, and when you do, impress the fashionistas around you with the fashion techie babble you just picked up! I discovered Wayne's blog Streetstyle Aesthetic this summer and became a regular reader since then. Oddly enough, his blog was the first street style photography blog I've ever read (and now I read a whole bunch of them!). I really admire his relevant portrayal of fashionable London individuals and enjoy reading his little insights into their lives and their closets. I like that many of those people are just regular guys and girls - students, young professionals, travelers... And the occasional models or actresses also appear on Wayne's blog to satisfy my curiosity. Last week Wayne posted a set of photographs of a really pretty and unusual looking girl called Hannah, who was wearing an entirely vintage ensemble and looked so dreamy and relaxed. 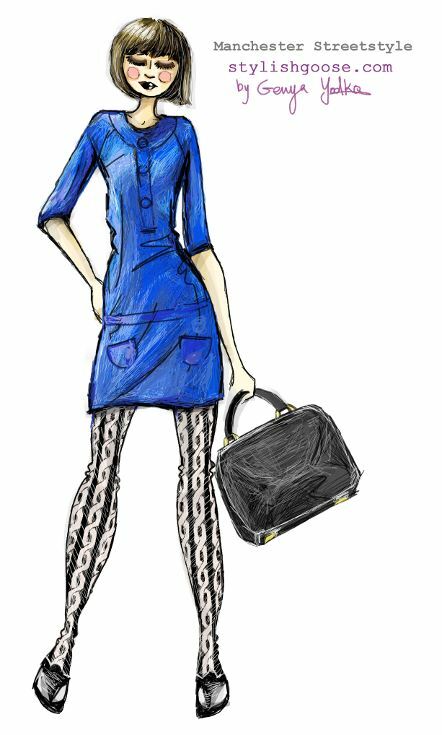 My illustration was inspired by Hannah's style, as captured by Wayne Tippetts. A black, oversized, velvety T-shirt accessorized with bulky gold bling and paired with simple hair and clean make-up create this carefree, standout look. Erdem Erdem Erdem. How I love this talented designer. If I could meet and chat with only one designer, that would be him. His colourful floral prints and rich layered lace dresses are his signatures. Every dress is a craving, but completely own-able. 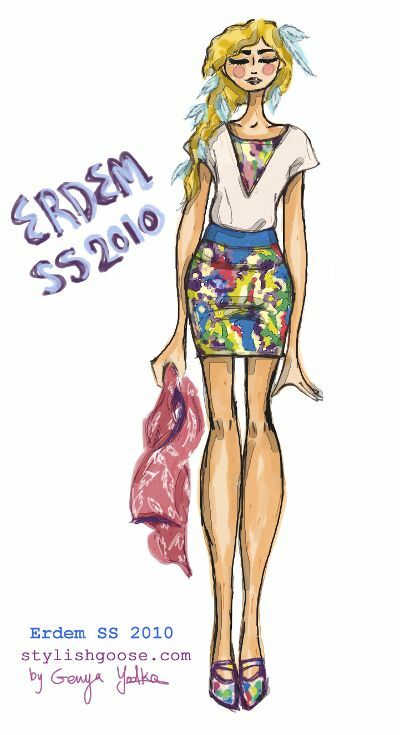 My illustration is of one of the beautifully embroidered and screen-printed pansy looks from his latest Spring Summer 2010 collection. I had a really hard time picking which look to illustrate, but finally settled on this one, with a promise to myself of drawing some more of him later. I love the relaxed look of the boat neck and the easy fit of the T-shirt-like top. I also like that the look consists of separates, makes life interesting :). Oh, and the matching print shoes are just adorable. I am posting this with a lot of national pride, as Erdem was born and raised in Montreal, Canada! Some loony banana pants for you? Yes, please! 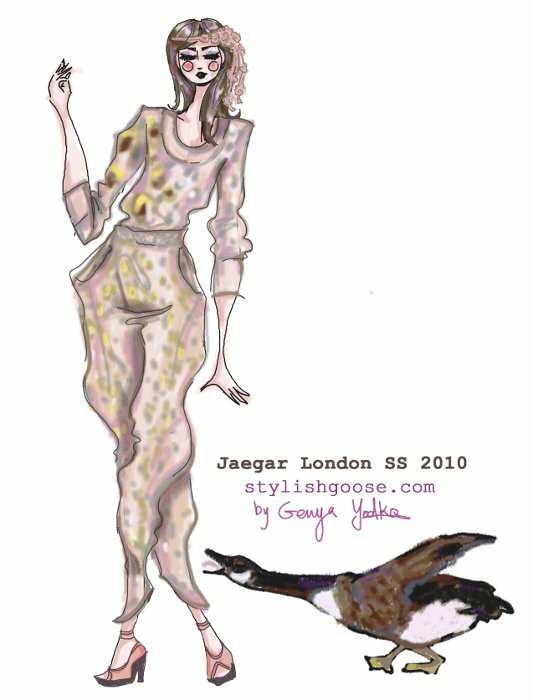 From the Jaeger London RTW SS 2010 collection. A cute silky top and some wide pants with metallic print applique. See it on style.com. Tim Blanks described those awesome pants as "some of the strangest pants of the season: loony, flaring banana pants and dhotis that were somehow hobbled round the hem." Despite this (or maybe even BECAUSE of this), I am a fan!! !